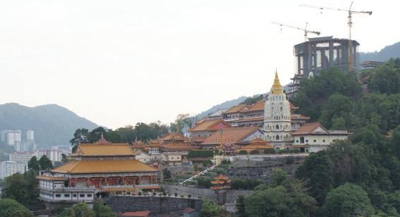 The Kek Lok Si is said to be the largest Buddhist temple in Southeast Asia. It was first constructed since 1890, and with the amount of devotees that it gathers around the world, there are constant renovations and upgrades to the buildings. Kek Lok Si is about 30 minutes from the heart of George Town. There is a market at the foot of the hill where the pagoda is, and there are also a lot of older shop houses and hawker centres. You can expect the traffic to be pretty heavy most of the time, but it will not be an unmoving traffic. It is just that there are a lot of pedestrians and people buying and selling things, so motorized vehicles will need to give way to them. This will include buses, cars, motorcycles and bicycles. Yes, there are buses. To get there from George Town, you may hop on to any of these buses: 201, 203, 204, 206, 306, or U502. If you are unsure, you may always ask the bus company representatives at the bus terminal and they will let you know. You can tell them just the name “Kek Lok Si”, and they will direct you to the right bus. The temple is really that popular in the island. When you get on the bus, you can always tell the bus driver that you want to go to “Kek Lok Si” and the bus driver will let you know when you arrive. Going to Kek Lok Si is more fun if you go by foot, rather than by car where you just drive up there to the mid section of the hill where the parking is. If you start from the foot of the hill, you will need to climb some stairs up. On both sides of the stairs, there are shops, selling clothes from The Fifth Collection, toys and souvenir items. There are also local produce such as nutmeg products that are made into preserved food or medicated oil. There is a pond with a wooden bridge at the Kek Lok Si, with a lot of tortoises in there. The tortoises may be young, or may be more than 10 years old. It is a common thing for visitors to buy fresh vegetables from the vendors at the pond area to feed the tortoise, by throwing in the pieces of fresh vegetables into the pond. The tortoises delight in it, although sometimes if there are too much food, you might not see them eating those vegetables that you throw in. Do not despair, because when the tortoises get hungry, they will munch on the vegetables that you threw in for them. Of course the main feature of the Kek Lok Si is the pagoda. It is a pagoda that gets narrower at the top, unlike the parallel cylinder shape of the Tower of Pisa. It is a challenge for those who are afraid of heights. You will need to pay an entrance fee to get into the pagoda, and to climb up the stairs. At each level, there will be the feature of a certain Buddha, and the stairs get narrower as you get to a higher level. It may be hard to walk with shoes on, you may seem to need to tiptoe. But it will be worth the walk, because the view from the top is really beautiful, thanks to the lovely landscape of Penang, both natural and man-made. It will give you a feeling of how it looks like from “up there”, and let you see how far and wide the world is and just how small we really are. There is a new vernacular train service that brings you to the new Guan Yin statue, a very huge statue protected by a pavilion. The devotees contributed a lot of money to the building of this statue, although many people may complain that it seems to be always “under construction”. It is not easy to make such a structure. Chinese New Year is the time when Kek Lok Si is at its most beautiful. There will be thousands of lights outlining the structure of the temple, a real sight to behold. 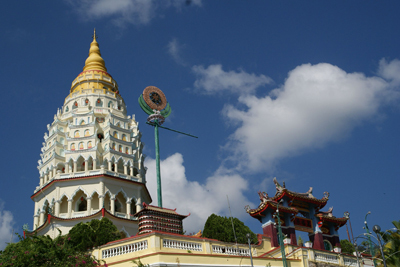 This entry was posted in Tourism & Leisure and tagged Kek Lok Si, Pagoda, Temple by admin. Bookmark the permalink.